New York City is the hub of every new exciting cultural event that could happen. Fashion experts thrive in the city that never sleeps. Entrepreneurs galore reside in its piercing towers. Best of all: the boozy hotspots are perfect for a weekend date night. New York City has five of the thirteen three-Michelin star restaurants in the United States, making it the mainstay for any foodie. What better way to follow up the ultimate dinner than with a trip to the best bars in NYC? Check out these top five bars to discover for your next NYC romantic getaway! 1. 7B: Sometimes called Horseshoe Bar or Vasac’s, or U, this grungy bar is located on the corner of Avenue B and East Seventh Street. It’s namesake, the horseshoe shaped bar in the center, has often been featured in movies like Godfather II, Jessica Jones, and Rent. It’s one of the last remaining relics of East Village. It’s grunge, it’s metal, it’s history. 2. Angel’s Share: If you’re looking for wicked concoctions hidden behind an unmarked door, this is your spot. The hidden Japanese cocktail lounge is tucked into the back of restaurant Village Yokocho in East Village, a tip of the hat to old-fashioned speakeasies. This lounge has been around for twenty five years and excels at flashy drinks. Check out their Smoke Gets in Your Eyes, a bourbon-based cocktail that’s delivered cloaked in smoke from burning cinnamon and cloves. 3. Barcade: Bar meets arcade in this craft brew brilliance. The business model of a large selection of craft brews paired with an even larger selection of retro arcade games has made this adult version of your favorite high-school hangout an extremely successful empire that’s expanded across the Northeast. The original, founded right in NYC, feels like you’re hanging out in someone’s garage, the perfect escape from the hustling of city goers. 4. 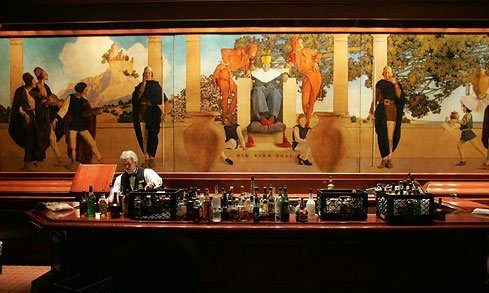 King Cole Bar: If you’re feeling like stepping out in celebrity style, King Cole Bar is the spot to be. Located in the St. Regis Hotel, it’s the penultimate of luxury, one that many of us can only afford on the rare occasion. A cocktail starts at $24 and to even get in requires “proper attire.” It’s worth a visit; this swanky bar is the original creator of the Bloody Mary and has six different versions on the menu. Bonus: the nuts are free. 5. PDT: Short for Please Don’t Tell, PDT is the epitome of a speakeasy. Entered only through a phone booth inside a hot dog joint on St. Mark’s Place. We recommend reservations as lines start forming at three pm every day. You can have cheesy tater tots or waffle fries snuggled in foil delivered right to the bar, paired with inventive remakes of Old Fashioneds or Sazeracs. What do you look for in your favorite bars? Share your NYC bar-hopping secrets below!